With all of this craziness flying around, I decided to do the only reasonable thing a person could do under the circumstances. I wrote a musical. Put more correctly, I wrote the book for a musical. 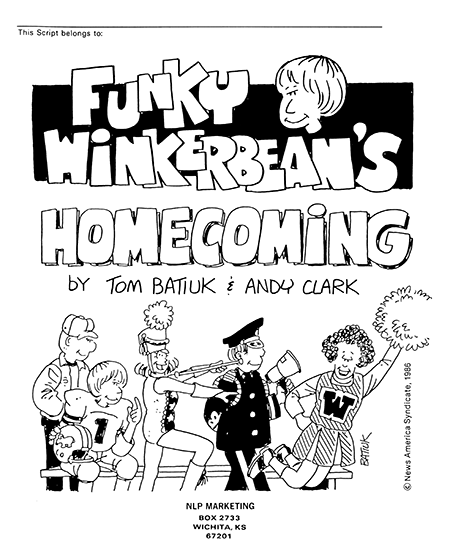 Andy Clark, the publisher of my band cartoon collections, and I were in Chicago during the holiday season for the Midwest Band and Orchestra Conference, when over dinner at the Berghoff he floated the idea of the two of us creating a musical featuring Funky Winkerbean. It would be a musical designed for high schools to perform. I would write the book and lyrics and Andy would write the music.